Tim is very close to the explosion. He is on fire and falls into the water. 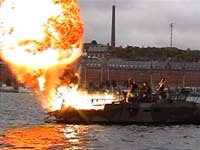 Erik and Henke are thrown into the water by the blast from a very large explosion. Picks up Tim and flies just above the water with Tim hanging underneath. 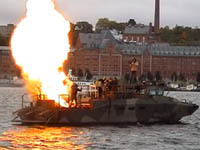 The Swedish Stuntgroup did stunts during a sea recue demonstration for a delegation from Thailand. 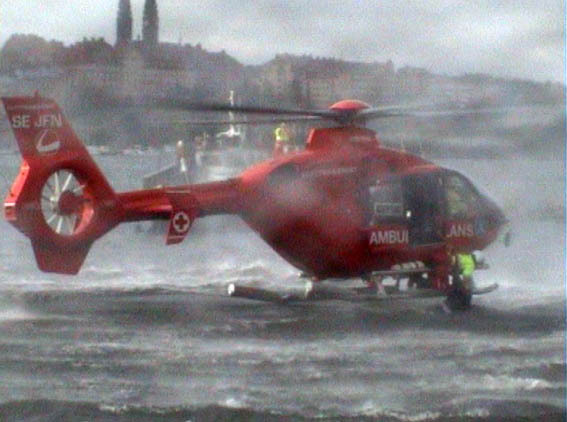 The object of the demonstration was to show how the Swedish public authorities, the Police, the Sea Rescue and the Medical Emergency Service work together during an emergency. 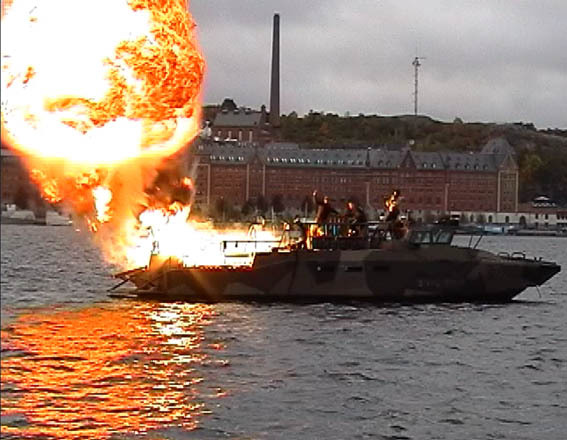 Five stuntmen from the Swedish Stuntgroup were on a military ship ("Stridsbåt 90") pretending to be ordinary people partying on a pleasure boat. 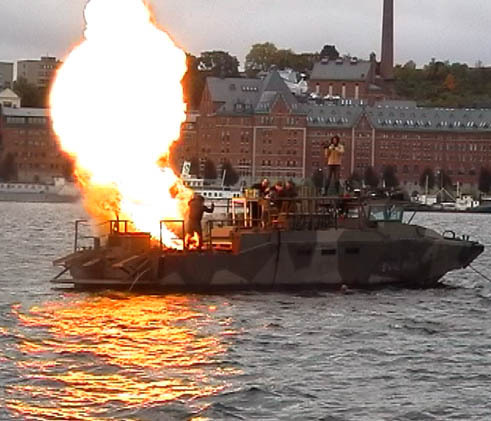 The ship was rigged with pyrotechnics by the highly experienced and cunning pyrotechnician Karl-Johan Fröjd. The demonstration starts by a loud bang and smoke starts pouring out. Everybody on the ship is confused and tries to find the cause of the ship malfunction. 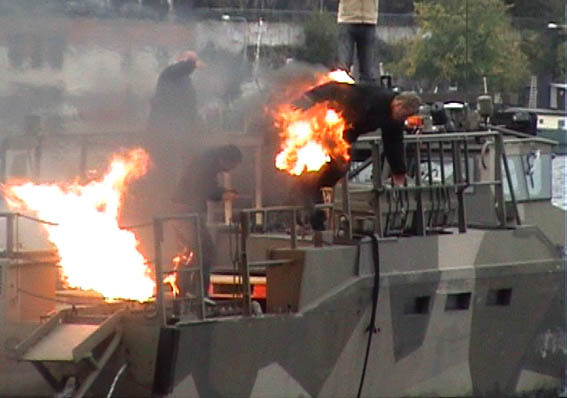 Suddenly flames appear and one of the sailors (Niklas Hedström) catches fire. Another sailor (Tim Man) tries to put him out but he also catches fire. Niklas throws himself overboard to escape the flames. He disappears into the deep and dark water. An sudden explosion throws Tim overboard and everybody else falls down. Panic erupts and the captain (Anders Strömbäck) runs and looks for Niklas who is nowhere to be seen. Badly injured by the explosion, Anders can't see where he is stepping. One of his legs catches fire and soon the rest of his body is engulfed in flames. The two remaining sailors, Erik and Henke try to find something to put out the fire with. Henke pulls out a fire extinguisher and finally manages to put out the burning Anders. Erik and Henke are trying to revive Anders who lies on the ship deck as a smouldering pile of burnt flesh. 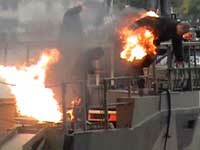 The fire on the deck has now reached the fuel tanks which cause a huge explosion. The pressure wave throws both Erik and Henke overboard. 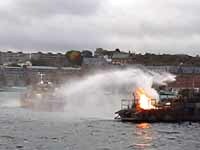 The Fire Department's boat arrives at the scene and put out the fire on deck. Then a rescue diver swims down to the bottom of the lake and emerges with Niklas. 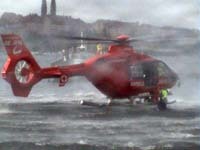 Tim is picked up by a helicopter which transports him to shore. Erik and Henke are rescued by a Jetski after being in the freezing water for over ten minutes. 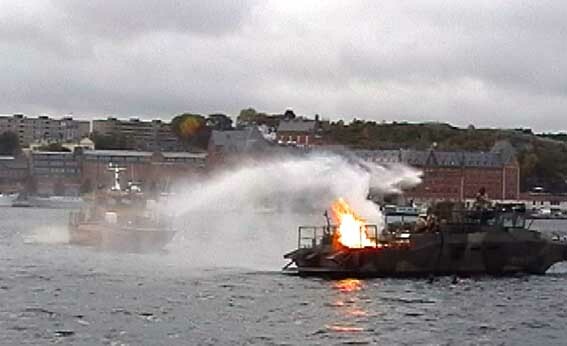 The demonstration ends by a rescue boat boarding the ship and transporting the badly injured Anders to an ambulance. The demonstration was a great success. The stunts worked like a charm and the rescue operation was well coordinated. Nobody got injured and everything went according to plan.